We keep seeing new breweries pop up around Portland. I sometimes wonder how all these places are going to fare, but you can't dwell on it. It seems the common dream of most brewers is to at some point open a brewery or pub. And so it is. The Commons Brewery is conveniently located in what beer geeks refer to as the Beermuda Triangle. The Triangle comprises much of Southeast Portland, and includes Hair of the Dog, Cascade Brewing Barrel House, The Green Dragon, Lucky Labrador, Hopworks, Coalition and several others. If you're keeping track at home, you can safely add The Commons to that list. This place is the brainchild of Mike Wright, who initially launched the brewery in the comfort of his Southeast Portland garage. 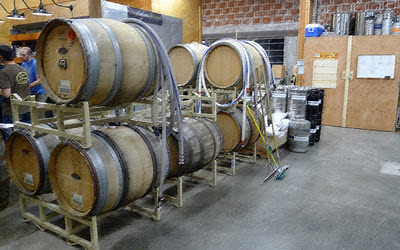 Soon thereafter, he decided to shoot the moon and expand his nano brewing setup to a 7 bbl operation in a space large enough to brew and conduct barrel fermentation. The new facility has been operational for a few months, and only recently opened its doors for tastings. A tasting room and brewery is what you'll find here. Wright says he has no designs on turning this location into a brewpub. He hopes to see his beers distributed in draft and bottled form. Some Commons beers have already been poured at pubs around town. The bottling effort will take some time. In contrast to most breweries and pubs, the Commons does not feature what I would describe as typical Portland beer fare. There's no IPA on the beer menu. No imperial IPA, either. They also don't offer a stout or a porter. What they produce is a line of Belgian-influenced beers that are designed to, as they put it, "enhance social interaction." The board shows two standard, year-round beers, along with a couple of seasonal offerings. Then there's the Beetje (pronounced bee-cha) Series. Beetje is a Flemish word, meaning little or little bit. 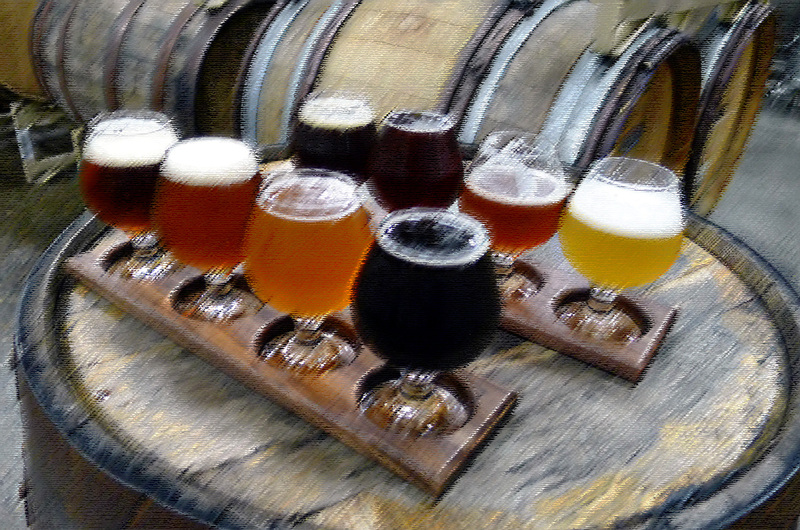 The term refers to small batch beers that are produced at the Commons using predominantly organic ingredients. Four Beetje beers graced the board when I stopped by. I opted for the double-fisted tasting experience: Eight wildly colorful beers in exquisite glass ware...and every one of them pretty good. I had several favorites, although opinions will certainly differ. 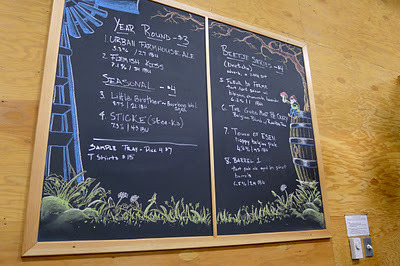 Urban Farmhouse Ale (5.3% | 27 IBU) This is the lightest of the beers on the board, brilliant gold in color. I am not a huge fan of this style, which is often over-carbonated and too yeasty/fruity for my taste. But this is a great beer. I would love to have one of these in the heat of the summer, though it tasted pretty good on a freezin' Friday evening. Light and refreshing with a subtle floral nose. When bottling eventually gets underway, this will be evidently the first beer to go that route. Little Brother (8.7% | 21 IBU) One of two seasonal offerings, Little Brother is a strong Belgian ale aged in bourbon barrels. The barrel aging adds some nice character to this beer...not over-the-top like you find with some bourbon barrel-aged beers. Little Brother is reminiscent of a light barley wine, with lots of chocolate and caramel notes. This is the biggest beer made here, although not that big compared to some of the monsters you find around town. Barrel 1 (6.8% | 21 IBU) This is a tart pale ale aged in pinot barrels. I'm a big fan of the sour beers available at the nearby Cascade Barrel House. Those beers only lose me when they get too sour. Barrel 1 is conservatively sour. It's a lovely beer, pleasantly tart and full of flavor. I look forward to seeing this beer available in a bottle. If you're heading over to check out The Commons, please note that tasting days and hours are limited. They are currently open Friday and Saturday evenings. That may change as things ramp up, so check their website, Facebook page or give them a call to verify. Unlike some of the smaller tasting spots, The Commons DOES take credit and debit cards...in case you're strapped for cash and need a great beer. Indeed, the checkout system is pretty cool. It probably goes with saying, but these beers are going to respond well to a bit of secondary fermentation in a bottle. It's a style thing. When the bottling part of the operation gets going and Commons beers are available that way, they will be prized purchases. In my opinion. 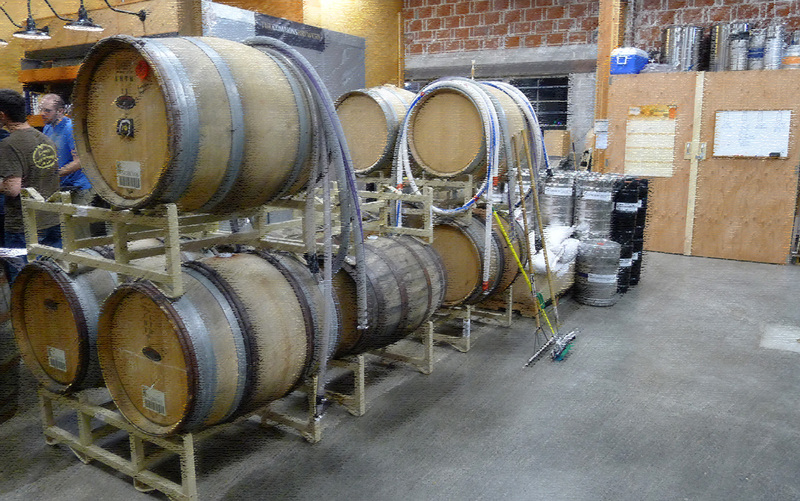 Finally, there is very limited bar space here, along with a few barrels. You will very likely find yourself walking around exploring the brewery while sipping the beer. No worries. 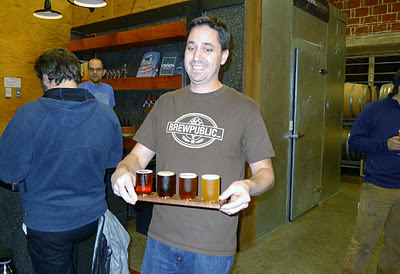 Mike was mingling with the tasters while I was there and he's happy to share what's happening with the beers.